Mascarpone is a triple-creme cheese, made from a generally low-fat (25%) content fresh cream. It's made from the milk of cows that have been fed special grasses filled with fresh herbs and flowers -- a special diet that creates a unique taste often described as "fresh and delicious." Mascarpone is used in regional dishes of Lombardy, where it is a specialty. It generally is used alone (sometimes a bit of sugar is added) or in zabaglione. Milky-white in color, it is a thick cream that is easily spread. When fresh, it smells like milk and cream, and often is used in place of butter to thicken and enrich rissoti. The cheese apparently originated in the area between Lodi and Abbiategrasso, west and south of Milan, probably in the late-16th or early-17th century. Some say the name came from "mas que bueno" (Spanish for "better than good"), although this may only have been a judgement made by a Spanish official when Lombardy was dominated by Spain. It also may have come from "mascarpa," a milk produce made from the whey of stracchino or aged cheese. Or, it may come from "mascarpia," the local dialect for ricotta, since both cheeses are made by a virtually identical process. The thought then, is that mascarpone originated as a by-product from other cheeses. Originally, it was produced in autumn and winter for immediate consumption. Generally, the cheese is sold right after processing and should be used immediately. If refrigerated, it will last about a week. The cow's milk is allowed to stand, and after rising naturally to the milk surface, the cream is skimmed off, poured into metal containers, and heated in a double boiler. Once it reaches 185 degrees Fahrenheit (85 Celcius), tartaric acid blended in water is added; the mixture thickens shortly, becoming very dense. It is allowed to rest refrigerated for 12 hours in special containers, where the whey separates. The mascarpone (minus the whey) is placed in cloth bags and allowed to further purge its whey for 24 additional hours. Nutritional Information: Mascarpone has 453 calories for each 100 grams (3-1/2 oz.) and a relatively high fat content of 47%. It contains very little protein. For those who wish to create their own mascarpone, there are several ways to go about it. In the Prodigy Guest Chefs Cookbook, Nick Malgieri posts this recipe for making 1 pound of mascarpone. You will need 1 quart whipping cream (not ultra pasteurized) and 1 tablespoon white wine vinegar (or lemon juice). 1. Choose a stainless steel bowl that fits inside a large saucepan without touching the bottom of the pan. 2. Add water to the pan and place the bowl in the pan so that the bowl touches the surface of the water but still sits firmly on the rim of the pan. 3. Remove the bowl, place the pan on medium heat, and bring the water to a boil. 4. Place the cream in the bowl and place over the boiling water. 5. Adjust the heat under the pan to medium, and heat the cream, checking the temperature often with an instant-read thermometer, to 190 degrees Fahrenheit, stirring occasionally. 6. Stir in the vinegar, continuing to stir gently until the cream begins to curdle. 7. Remove the pan from the heat, cover, and allow the curds to firm up for 10 minutes. 8. Line a strainer or colander with dampened cheesecloth, napkin, or coffee filters. 9. Set the curds into the strainer. 10. Allow the mascarpone to cool to room temperature, cover the strainer tightly with plastic wrap. 11. Refrigerate for 24 hours to allow the cheese to finish draining and become firm. 12. Store in the refrigerator in a tightly covered container. 13. Use within 3 to 4 days. Sometimes, it's a lot easier just to substitute. 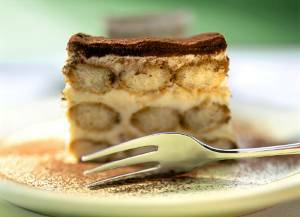 Tiramisu creators have used ricotta or cottage cheese as successful substitutes by whipping the cheese until it is smooth. Other sources have created their own substitutions. In the Epicurean Chef's Forum, "Kim" posted the following: "I found a substitution that worked okay is 8 ounces of softened cream cheese, plus 3 tablespoons of sour cream, plus 2 tablespoons of heavy cream (liquid, not whipped). 1). Blend 8 ounces softened cream cheese with 1/4 cup whipping cream. 2). Blend 8 ounces softened cream cheese with 1 tablespoon cream or butter or milk, or (3) Blend 6 ounces softened cream cheese with 1/4 cup butter and 1/4 cup cream (or Montrachet). Unfortunately, mascarpone isn't always available at your neighborhood supermarket. General instructions for hunting down mascarpone in your area include checking with gourmet shops or large chain grocery store delicatessens or select cheese areas. You can also check the Yellow Pages for Italian delicatessens and markets. This rich fresh CHEESE is slightly grainy but smoother than cottage CHEESE. It's white, moist and has a slightly sweet flavor. Most Italian ricottas are made from the WHEY drained off while making CHEESEs such as MOZZARELLA and PROVOLONE. Technically, this type of ricotta is not really CHEESE because it's made from a CHEESE by-product. In the United States, ricottas are usually made with a combination of WHEY and whole or skim milk. The word ricotta means "re-cooked," and is derived from the fact that the CHEESE is made by heating the WHEY from another cooked CHEESE. Ricotta is a popular ingredient in many Italian savory preparations like LASAGNA and MANICOTTI, as well as desserts like CASSATA and CHEESECAKE. The Food Lover's Companion, 2nd edition, by Sharon Tyler Herbst. 1. In a large kettle, combine the milk, yogurt and cream and bring to a boil over medium-high heat. Boil for 2 minutes, or until the milk is very curdled. 2. Line a large mesh strainer with a damp kitchen towel or several layers of damp cheesecloth, making sure the cloth extends well over the sides of the strainer. Place the strainer over a deep bowl and pour the milk through the strainer. Drain 30 minutes, making sure the strainer doesn't rest in liquid. Pots de Creme refers to both the custard dessert as well as the small lidded pots this dessert is served in. Pots de creme, or pot-au-creme translates from French to English as "pot of cream". The French do not have a word for "custard" the dish is simply referred to as "creme". The pots may also be referred to as "petits pots". Technically the pots de creme is a lightly set, baked custard. The "traditional" proportions for this dessert is one whole egg to every five egg yolks for 2 1/2 to 3 cups of liquid. A dessert made with these basic proportions will yield a barely firm custard. This is why the custard is best served in small pots (or ramekins). The earliest version of this dessert was baked and chilled prior to serving in the little cups. The method most common today is as follows. Milk, heavy cream or half and half is heated and the flavoring (commonly chocolate) is melted after the liquid is removed from the burner. The eggs are whisked until smooth. Then, the hot flavoring mixture is gently whisked into the eggs. The custard should then be strained through a fine sieve to remove any bits of egg or chocolate not properly incorporated. This will produce a very smooth custard. The empty cups are place in a baking dish. The mixture is poured into the cups until each is about 3/4 full. The custard is baked in a bath of hot water. This process allows the eggs to cook slowly and evenly. Hot water is added to the baking dish until the level reaches about half way up the sides of the pots. The covers are put on the pots (or the baking dish covered with foil) to prevent a "skin" from forming on the top of the custard. The custard is baked in a low to moderate oven for about 20 minutes. It's important not to overcook the eggs because they will get "rubbery". The traditional pots de creme flavor was vanilla but recipes can be found in many flavors including the very prominent chocolate as well as caramel, orange, pumpkin or coffee. Some of the recipes found for Pots de Creme are really more of a "moose" which contains either whipped cream or beaten egg whites. For those seeking out a lower fat version we came up with a recipe for a "soy" version we call "Soy Dreams" (extra rich chocolate) which is excellent. You may also want to try our unique and very easy to make Key Lime Pots de Creme which is just like a Key Lime pie without the crust. Custards as we know them today date back to the Middle Ages (Allen Davidson, Oxford Food Companion) when it was used as a filling for a Flan or a Tart. The word custard is derived from "crustade" which is a tart with a crust. After the 16th century fruit creams became popular and it was about this time that custards were made in individual dishes rather than a filling in a crust. The pots are typically made of porcelain and hold approximately 3 ounces of custard although this will vary from manufacturer to manufacturer. Most cups we have seen have a single tiny handle. The lids are normally adorned with a finial on top such as an acorn, a bird, or a piece of fruit. The designs vary from smooth, simple, white, devoid of any additional decoration to ornate gilded or floral patterns. A popular design for the cups was white porcelain with gold trim reminiscent of the simple gold and white Haviland Limoges pieces. According to Clare Le Corbeiller, decorative arts curator at the Metropolitan Museum of Art "in the eighteenth century this shape cup was called pots à jus". We have seen further mention of this use in Paris's Louvre where a table service produced in 1756 included these little pots with lids and matching saucers and it was documented that they were used to keep meat juices warm. Cynthia Magriel Wetzer wrote that in an exhibit of "re-created royal tables" in the mid 1990's "Sevres pots de creme were shown in settings for France's Louis XV, Christian VII of Denmark, and Catherine II of Russia". She went on to explain that the Sevres pieces were always shown as part of the dessert service, not part of the main dinner pieces. Although the lineage of the cup seems to be a bit confusing we do know that the cups have were manufactured from the 1700's to the early 1900's by such companies of Sevres, Worcester, Wedgwood, Meissen, Dresden, and Limoges. Most of the major European porcelain manufactures have produced pot de creme cups sometime in the past. It appears (but is not confirmed) that the pot de creme cup is in fact a relative of the Spanish (and later Mexican) chocolate cup. Early cups were small without any handle. The first "chocolate cup and saucer" was invented around 1640 by Marques de Mancera, Viceroy of Peru (from 1639 - 1648). According to Alan Davidson, Oxford Food Companion, Mancera witnessed " a guest at a reception accidentally spill her clumsy traditional chocolate pot." The object of his invention was called a "mancerina". This handy saucer had a built-in "clip" that secured the cup to the saucer making it nice and stable for the drinker. Some of the earliest versions were made of silver but there appear to have been pottery and porcelain versions as well. In addition to the single and double handled cups we occasionally find pots with no handle at all. These cups do seem more likely to have been produced for a dessert given the early function of the handle(s) was to keep the users fingers cool while handling a cup with warm ingredients. The dessert and the pots became popular again in our "modern" era during the 1960's and 1970's. U.S. Manufacturers such as Fitz and Floyd produced many patterns (most manufactured in Japan) including the cup we use as our logo. Popularity declined once again in the 1980's. We suspect the reason for this was the trend towards "lower fat" dining. In fact, in one cookbook that offered pots de creme recipes the writer made a point to say that he did not have the conscience to serve such a fat laden dessert to his dinner guests. If you are a collector, or you just like to cook, pots de creme cups are fun to use and make great gifts. A ten minute browse through a couple of books on porcelain will show you that there are many style cups with lids that are frequently confused with pot de creme cups. Put in a search on this website for Pots de Creme recipes.